These enameled moths and the plaster pedestal were my contributions to a collaborative installation exploring Silk Worms and industrial systems. Silk - a luxurious fiber used to string pearls, knit lingerie, weave fine robes - is spun from the fluid excreted by silkworms to spin their cocoons. While pupating within their silken cocoons, the silkworms metamorphosize into flightless, mouthless, moths with large downy bodies and tiny wings. The moths live for barely a week- mating, laying eggs, and dying. Bombyx Mori, the mulberry silkworm, is not found outside environments other than those in which they are specifically farmed. 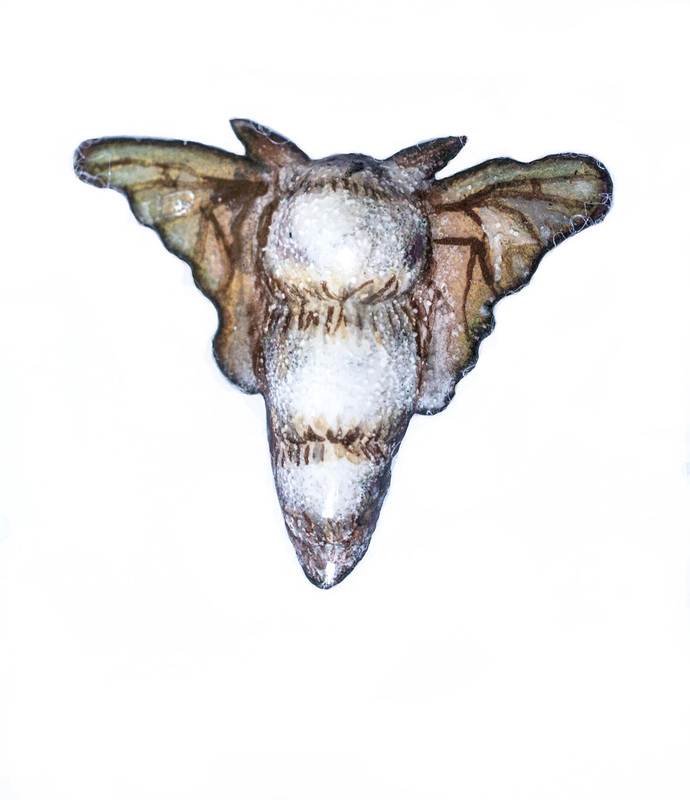 Like their tiny wings, Bombyx Mori are themselves a vestigial phase of the silk industry. How have we come to transform living creatures into machines of industry? What is natural? This biological widget - at once organic and anthropogenic - is both cog and factory, a producer of raw materials and part of a more vast industrial system. Through Bombyx Mori we can explore the handprint of human intervention and industry on the life and form of a creature perceived to be natural. "Too Much of a Good Thing", a collaboration with Maggie Ross Price, was installed at Ball State University in March of 2013. 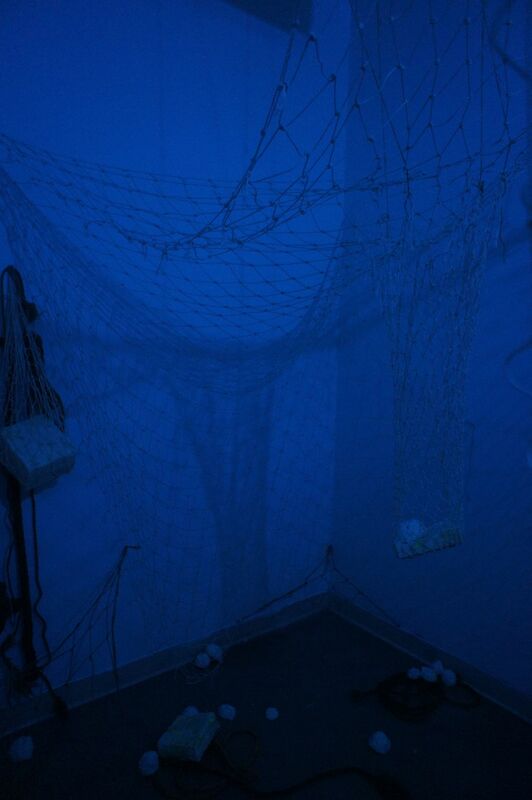 Our materials were nets fabricated from rope and twine, as well as lightbulbs, sugar, and to-do lists. Our objective with this piece is to explore and express our experiences of sleeplessness (late night wakefulness). What causes insomnia? Why can't we sleep? What is the experience of wakefulness like when one desires, needs, sleep? A quick internet search reveals a variety of things that could affect one’s ability to experience restful slumber - ranging from diet to anxiety to lifestyle to hormones. 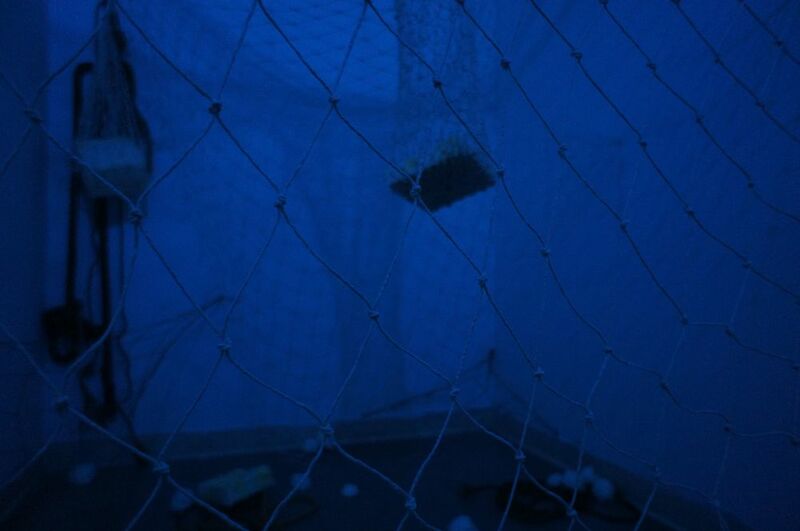 We have represented a variety of these potential insomnia-catalysts here: sugar, our torn-up to-do lists, rope and nets (symbolizing obsessive thought and activity, as well as the feeling of being caught between the states of sleep and wakefulness). These items occupy atmospheric blue small space: both relaxing and claustrophobic, meditative and obsessive. In April of 2013 I participated in a group show called "Kids These Days." This is the show statement I produced for the exhibition. The work in this show is an exercise in identity. Through the work created for this exhibition, we begin to traverse the territory of our own generation. Who are we? Where do we come from? What do we want you to know about our lived experiences? Our process of self-discovery involves much experimentation, trying on different personas while looking ahead, behind, and inside for influences. Amidst the abundance of social media, we understand that identity is a thing, constructed and liable to change. Sometimes we are learning through our pieces - cartographers charting territories unknown. Sometimes we are teaching you - sharing intellectual investigations of histories both learned and discovered. Concurrent with identity is language; ours is one of technology. Attendant to that technology is speed. Our glyphs - “memes” - emerge, spread, and transform through their perfect function as shorthand, instantly conveying complex emotional, intellectual (and often absurd) experiences common within our generation. Whether we embrace or run from these pervasive modern conveniences, their ubiquity makes their influence undeniable. With the world at our fingertips, we become archivists of the world’s information, arranging and editing the work of others and incorporating it with our own. We are caught between nostalgia and rebellion. Sometimes in opposition to, sometimes nostalgic for, “the way things were,” we move inextricably forward in time. We are Millennials regardless of our feelings on the subject. Like generations before us, we have come of age in times of catastrophe and decline: September 11th 2001, The Great Recession, The War on Terror. In spite of this limitless access to information, we often struggle with a sense of detachment, desensitized and overwhelmed by our over-exposure to knowledge. The streaming video is the antidote that creates continuity. Sometimes all we can do is make a punchline from the pain, get a laugh at our own expense. Regardless of this prevailing negativity, our generation embodies optimistic entrepreneurship, unbridled uncertainty as to the necessity of action, and self-determination. We adapt rapidly and chase our desires at any cost. Yes, we have been inculcated to want the moon. Yes, we feel entitled to it. These unrealistic urges are our bomb-shelter in a world embarrassed to have set our expectations so high. As members of this new Lost Generation, we continue to find our way. Kids These Days maps the diversity of routes taken as we negotiate our collective contemporary landscape.